The study aimed at predicting the effects of an earthquake in the city of Banda Aceh, estimating casualties, injuries and damage ratio as well as distribution according to earthquake intensity and time of the day. Tectonic and geological datasets were collected and processed with GIS software to generate intensity maps for different earthquake scenarios. Geo-electrical data was acquired and analyzed to determine groundwater levels, which affect soil liquefaction. An inventory of over 62,000 buildings was carried out, dividing the buildings in four categories with different fragility rates. The datasets were combined and analyzed to estimate the percentage of damages and injuries based on predicted building occupancy. The study developed four models – three earthquakes generated from the Aceh segment of the Great Sumatran Fault (Mw 7, Mw 6.5, and Mw 6) and one from the Seulimuem segment (Mw6.5). The analysis produced a map of building damages for each scenario. 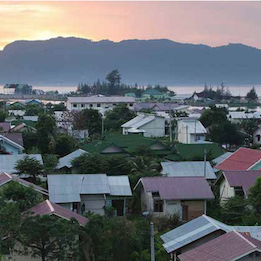 The study showed that the strongest earthquake from the Aceh segment would damage 47-75% of the town’s buildings and injure 5 to 26% of the population in almost all of the town’s sub districts during day time, and 22% of the population during night time (over 57,700 people). The study produced maps showing the vulnerability of Banda Aceh subdistricts to earthquakes, and an estimate of damages and injuries that different intensity earthquakes would cause. The findings were presented to local government and non-governmental organizations’ representatives during a seminar in September 2017. City officials confirmed that the study provides key knowledge that can support preparedness plans, including targeted building restoration and the development of earthquake simulation programs.